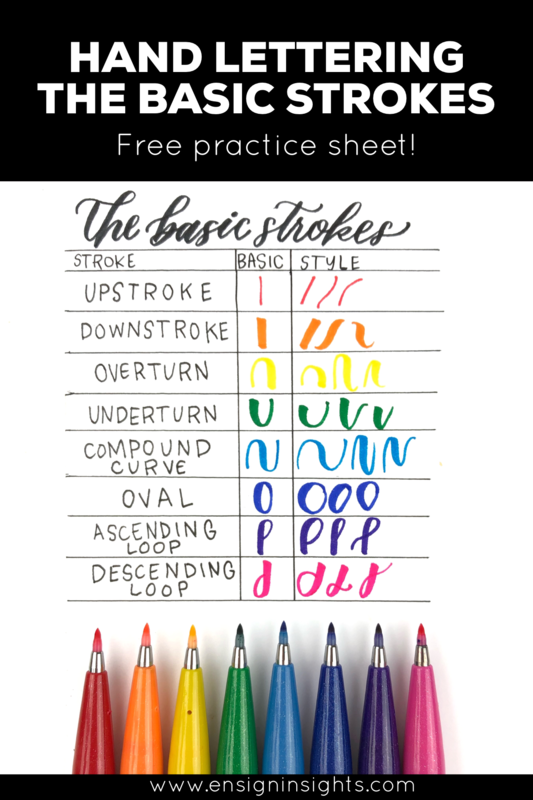 Do you practice the basic strokes? Hand lettering the basic strokes is such an important part of learning hand lettering! 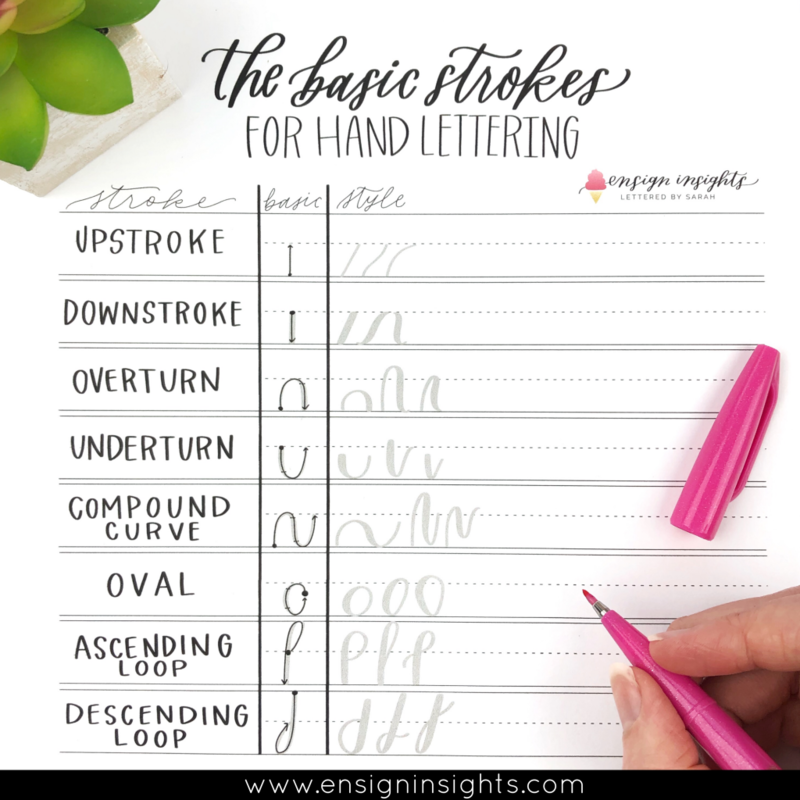 If you can master each of the basic strokes, you can master any letter. 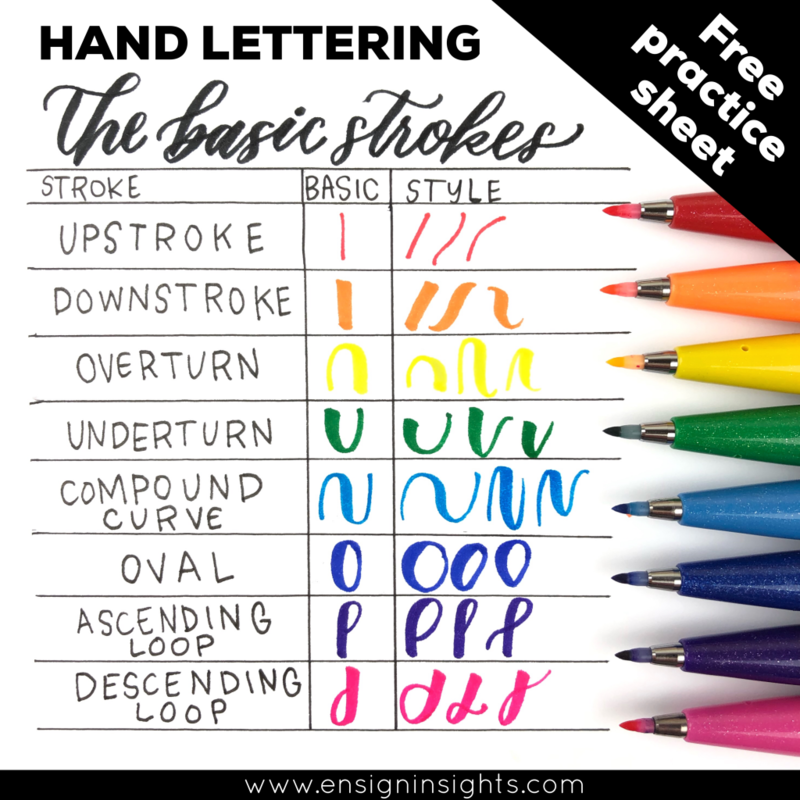 I will show you each basic stroke here, and I will tell you how to download your very own free hand lettering worksheet of the calligraphy strokes chart. Remember, the most basic aspect of hand lettering is that upstrokes are thin and down strokes are thick. Every hand lettering beginner should practice getting thin upstrokes and thick down strokes by putting different amounts of pressure on the nib of the pen. Let’s go ahead and break down the basic strokes for brush lettering. 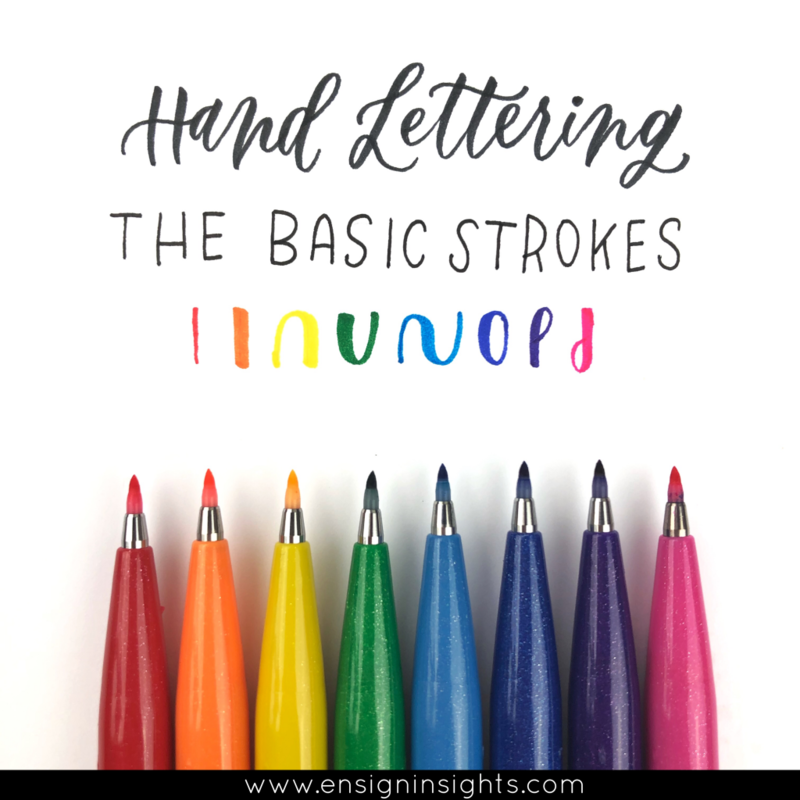 I will be breaking down the basic strokes for you here. The very first basic stroke I practice is the upstroke. The idea is that you are using the very tip of the pen with very little pressure. 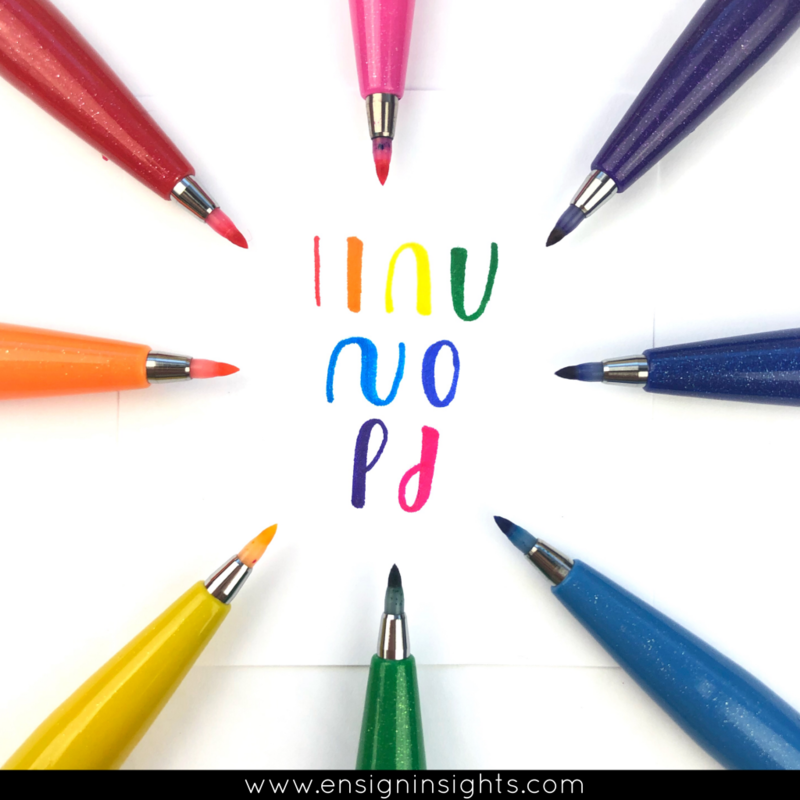 You’ll want to practice bringing your pen up since that’s how you’ll do it in words. With the down stroke, you want to practice giving heavy pressure to your pen. Every brush pen is a little different so it’s important to practice with different amounts of pressure to see how much of a variety you have as well as how much bounce the nib of your brush pen has. When you letter the overturn, you want to start giving some pressure when you’re at the very top of the curve and gradually ease into giving your pen full pressure so you get a nice smooth curve. When lettering the basic strokes, the underturn tends to be one of the trickier strokes. That’s because you have to start releasing the pressure right before you get to the bottom of the curve. If it was on a clock, you’d want to release it at about 7:00. If you release it when you’re at the bottom of the curve, you will get what we call a saggy bottom. No one wants a saggy bottom in your lettering! The compound curve is basically the underturn and overturn in one, with no breaks. So you have to think about giving your pen gradual pressure at the top of the curve and then lifting at about the 7:00 right before the bottom of the curve. This one definitely takes some practice. The oval is the basic stroke that a lot of people struggle with. Although I have heard that lefties have an easier time with it. You want to start at about 1:00 and then your pen is going to the left of the page this time and you will push it out towards the left as you’re applying the heavier pressure. Once again, you will lift the pressure just before it gets to the bottom of the curve so you don’t get a saggy bottom. The ascending loop is the basic stroke that goes above your midline like “l”, “h”, “k”, “d”, etc. This one is really fun to play with when you are doing different styles. You start in the middle to start with the loop, and at the top of the curve, you will push it to the left just like the oval. Then it will be thick all the way down. 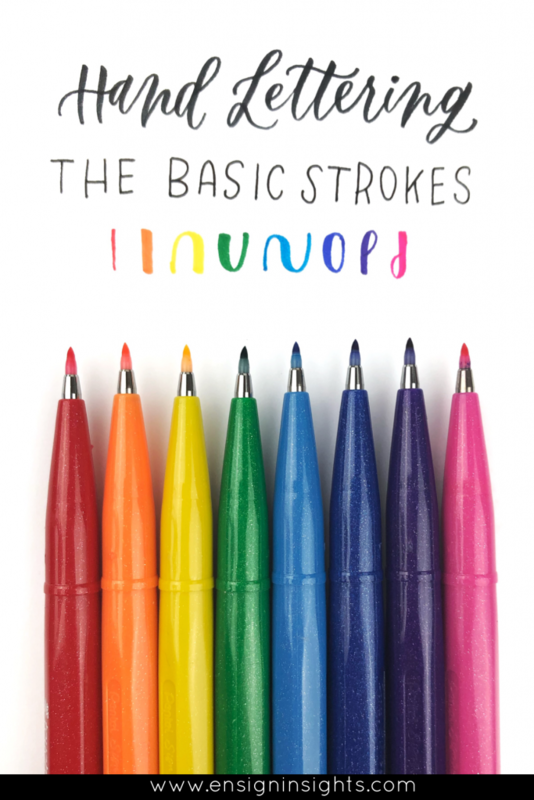 This is the last one in our breaking down the basic strokes series. The descending loop is basically just opposite of the ascending loop for letters like “g”, “y”, “j”, etc. Once again you want to watch out for the soggy bottom. You are pushing your pen to the left of the page just like the oval, but from the bottom up instead of top down. Now that I’ve broken them down, it’s time for practicing the basic strokes! We can’t practice enough! I also add some variety to my basic strokes because it’s good to start working your creative muscles in creating new styles, even just with the basic strokes. 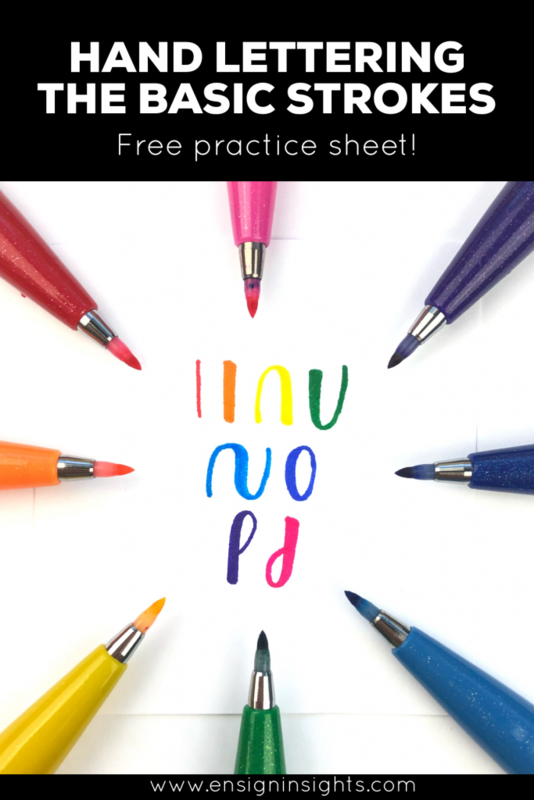 I am inviting you to join the Insider Scoop to get access to this free lettering practice sheet of the basic strokes chart. Enter the Insider Scoop or sign up here.